Reviewed by Antje Kley on 2011-10-06. This concise volume sets out to frame historically the rich and diverse period of American literature from the ending of the Civil War to the stock market crash of 1929. As the second volume on American Literature in Blackwell's "Literature in Context" series, it comes between Susan Castillo's American Literature in Context to 1865 and Yannella's own American Literature in Context after 1929 (both 2010). Conceived as a set of primers on history for students of literature, the series adopts a traditionally mimetic aesthetics that avoids being recognized as an aesthetics at all: each volume is meant to "demonstrate how context contributes to meaning" in a literary text (front matter) as well as to show that the stability of meaning may be guaranteed by the authors' engagement with the socio-political issues of their time and by the directness with which they express their presumed intentions. This agenda casually ignores other factors at work in the construction of meaning, such as literary form, linguistic structure, and readers' expectations. In other words, this book avoids discussing what specific elements make a work of literature literary. As Jonathan Culler explains in his widely received Literary Theory: A Very Short Introduction (2nd ed., Oxford UP, 2011): "literature involves both properties of language and a special kind of attention to language" (52). The "Literature in Context" series considers neither. Thus pursuing a decidedly mimetic and occasionally expressivist approach, Yannella asserts that literary writing was the ethnography of post-bellum America and that its writers were considered interpretive authorities by their audiences (1). Focusing on the three literary categories most commonly identified with the period -- realism, naturalism, and regionalism -- Yannella circumvents authors who "were not attracted or were repelled by social issues" (4). He does not even aim to contextualize literary writing in general, insofar as it includes modernist and experimental writing (which may be linked to historical, social and scientific contexts); in his mimetic conception of literature, the writer simply represents historical realities that are presumably given, ready-made, as the context for the literary work. The table of contents also confirms that this book pursues the cause-and-effect model of extrinsic ("old") historicism, which, as Lee Patterson explains, aims "to specify the forces that caused, governed, entailed, or were expressed by literary texts -- what made them what they were rather than something else -- and the routes by which these forces exerted their influence upon literature" (Lentricchia/McLaughlin, Critical Terms for Literary Study, Oxford UP, 1995, 250-62). Without mentioning literary traditions, genres, or aesthetic concerns, the table of contents indicates that the chief topics of the book are the Civil War, Reconstruction, immigration, city-country differences, economic inequality, Progressivism, and the beginning of the First World War. Since "much of the social content of the writing is lost on modern readers," Yannella claims, "literary works are often ripped from their contexts and their meanings destroyed, their richness lessened" (3). In the first half (and sometimes more) of each chapter, therefore, he furnishes an informative but rather conventional historical narrative based on extensive research in newspaper and magazine archives, in government publications, popular book discussions and other documentary sources on the acceptance and exclusion of racial minorities, class conflict, progressivism, and city-country differences. He thereby avoids refiguring the relation of literature--as one of many forms of cultural production--to other kinds of writing in a more openly discursive approach to his period. Besides recovering historical facts, Yannella serves the mission of the series as a whole by reinstating the author as the ultimate guarantor of textual meaning. "The chapters," he states (in his introduction), "describe how the issues might have been understood at the time by a curious, intelligent person -- a smart writer, for example -- who read considerably in contemporary sources including newspapers, magazines, nonfiction accounts, and so forth" (4). Trying to imagine the mindset of those living in each period and to avoid anachronisms, he refrains from terms that were coined or gained currency only later, such as "robber barons" and "Social Darwinism" (77), and he eschews revisionist history. Yet revisionist history clearly informs his way of framing post-bellum American literature during a time of upheaval and transformation, of juxtaposing the national narrative of progress with the very different counter-narratives of the African American struggle for legal and social equality, of Native American decimation, and of multinational mass immigration. Also, in a move he could not have made if he had refused to consult recent interpretations of his period, he takes information on the authors he treats from the authoritative American National Biography Online. Yannella's attempt to efface his own historical position is troubling, then, especially as it resonates with the series' assumption that historical facts are fixed and impervious to the continuously conditioned social practice of interpretive reception. The second parts of the six thematic chapters do little better than the first parts. "Not intended to be complete discussions of literary works," they are meant as "relatively brief examples of how to read texts in their contexts" (4). On never more than ten pages, these parts succeed in identifying authors and texts that meet the criteria set by this book. They frequently fall short, however, in explaining how literary texts use fictional modes to explore the issues they address. Anyone actually interested in reading these texts will be disappointed by the sketchy plot summaries, an almost exclusive focus on the diegetic level, decontextualized quotations, and frequent conflations of narrators and authors. Why read literature at all when all it does is rehash history or authors' opinions -- both of which are presumably more accessible in history books, essays, and (auto)biographies? Yannella himself seems to have realized that the concept of the series elides the functions of the literary. "Writers," he admits, "do not usually write about historical events and patterns, demographic shifts, natural or man-made catastrophes, and so forth. They do, however," he continues, "sometimes without even knowing that they are doing it, write about the human impact of events, the particular feel and texture of history as experienced by their characters" (3). Yannella thus implies a distinction between history, which records actual events or developements, and literature, which explores their impact on one or more imagined characters. To adapt social discourses and flesh out discussions of the social, cultural, artistic or scientific issues of their time, writers certainly use characters--and, I might add, semantics of place and time, narrative perspectives, intricately structured plot lines, metafictional devices, intertextual references, and so on. This volume, however, values such devices only where they serve to provide verisimilitude and ostensibly reveal an author's personal disposition. Apropos Twain's Huckleberry Finn, for instance, Yannella writes: "Twain probably knew slavery better than any other important writer of the period. [...] All of that knowledge can be felt in the novel, as can the varieties of dumb, hateful, white belief about blacks" (27; my emphasis). A book that promises "brief examples of how to read texts in their contexts" (4; my emphasis) should offer more than such vague, generalizing statements about literary texts. Since the Civil War "did not produce a great body of fiction" beyond the work of Bierce and Crane (10), chapter 1 cursorily mentions the poetry it inspired--both ephemeral and enduring. Slighting Emily Dickinson's work, Yannella highlights the unprecedented candor of Whitman's poetry, which directly critiqued the ideology of patriotism. Likewise, Yannella's discussion of Crane's early modernist combat novel The Red Badge of Courage (1895) underlines its skeptical perspective on the nation's patriotism. This reading is one of the longest -- and, with its focus on the protagonist's revisions of his own memories and motivations, strongest -- in the book (12-15). Chapter 2, on black Americans after Emancipation, examines literary responses to Reconstruction and its disintegration as well as the Indian Wars in both political discourse (W.E.B. DuBois and Booker T. Washington) and more literary writing by Joel Chandler Harris, Theodore Dreiser, Upton Sinclair, Mark Twain, Gertrude Stein and Charles W. Chestnutt. In representing black Americans, Yannella asserts, these writers either reproduced popular stereotypes or attempted "to convey the humanity of black people" (27). Apropos Huckleberry Finn and Stein's story "Melanctha" (from Three Lives , her first published work), Yannella finds "[r]ational thought . . . in very short supply in these, as in many other, American fictions of the era, regardless of race or ethnicity or social class or gender" (29). He thus raises questions about textual framing that he otherwise tends to neglect: questions like who says what to whom in what context, and how are a character's actions and claims evaluated within the text? But he also implies that irrationality hampers what rationality would enable: the destruction of racist stereotypes. This idea is clearly denied by Huckleberry Finn, which makes the irrational and naïve character of Huck the most humane figure in the text. Chapter 3 charts American writers' responses to immigration and immigrant destinies with a particular focus on the first generation of Jewish immigrant writing at the turn of the nineteenth century. At the same time, as explained in Chapter 4 ("Countrysides"), writers from Sarah Orne Jewett and Edith Wharton to Robert Frost and Sherwood Anderson showed "how local environments shaped character, established outlooks, and defined individual possibilities" (60). Chapter 5 ("The Poor and Wealthy") documents the fundamental contradiction between poverty and industrial progress in the early decades of the 20th century before inspecting "some of the literature focused on wealthy people" (77). While living conditions were pervasively dire among the working poor, the widely and reverently told success stories of the Rockefellers, Vanderbilts, Guggenheims, and Carnegies fed popular belief in the value of rugged individualism and the ubiquity of opportunity in America. In spite of all empirical evidence to the contrary, such as that furnished by the Industrial Relations Commission report of 1916, Americans were led to believe that poverty was self-created, that the poor were simply lazy and morally deprived. In literary writing of the time, however, Yannella finds popular trust in upward mobility challenged by "considerable skepticism" (78). But when he reads writing by Henry James, Edith Wharton, and Kate Chopin as "the classic literature of wealth," and as period pieces detailing the living conditions of the frivolously rich, he reduces work that is both aesthetically and socially innovative to a set of lifestyle illustrations. The discussion of James's short novel Daisy Miller, in particular, shows what Yannella loses by tracking only its story line. Reflecting contemporary explanations of consciousness, specifically those of James's brother William as well as of James Cooley, the novel is famous for its effective use of internally focalized narrative perspective to show how social expectation and judgment co-constitute a character that is purportedly viewed only from the outside. But Yannella treats the text as simply the story of a rich, misbehaved, neglected girl and an ostentatiously well-mannered libertine addicted to observation and analysis (79-81). Varying the structure used in the other chapters, chapter 6 separately covers three historical movements--Temperance, the Union Movement, and Socialisms-- together with the literary responses to each. Here Yannella barely explains how the representation of heavy drinking in texts by various writers comments on the world outside them: it may serve to discredit reformers (Twain), to signify familial dysfunction (Crane, McTeague, Cather), to explore social conditions leading to drinking (Sinclair), or simply as a "triggering device for life-changing events" (91; Dreiser). As for the Union Movement, Yannella quickly summarizes some of the typical strike stories published by unions to illustrate their "understanding of the core characteristics and modes of behavior of employees, employers, and representatives of government" (93). Chapter 7, ranging from America's entry into World War I up to the Crash of 1929, closes the volume by considering how the works of Fitzgerald, Cather, Hemingway, Williams, Lewis, Hughes and Hurston critically assessed the war and postwar depression, prosperity, and nationalism. This well-produced volume occasionally exhibits a careless dearth of quotation marks, as in discussing D.W. Griffith's racist film Birth of a Nation (25) and popular conceptions of Irish immigrants (33), and at one point Kate Chopin's protagonist Edna Pontellier is called Agnes (52). More seriously, what characters do or say and what entire texts achieve are treated as the same thing and both reported in past tense. Thus Yannella conflates fictional characters with historical personages and again disregards the effects of characterization, narrative technique, or lyrical presentation. 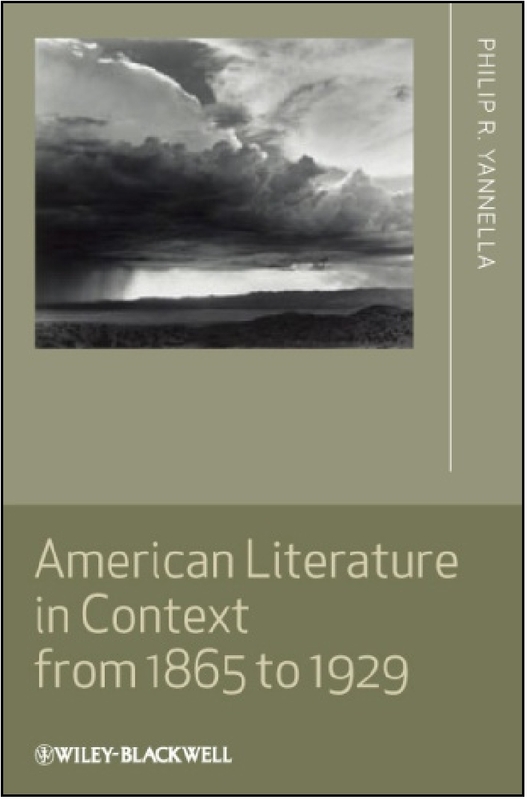 Altogether, Yannella's volume presents a distinct but narrow vision of the powers of American literature from 1865 to 1929. It tells us only how history validates that literature, which is otherwise apparently inconsequential. It may be useful for upper-division undergraduates and above (who may see the volume's shortcomings along with its strengths) and for anyone interested in the literary mimesis of socio-historical developments. Those who want more comprehensive, more research-oriented, and more systematically differentiated information should consult Susan V. Donaldson's Competing Voices: The American Novel, 1865-1914 (NY: Twayne, 1998), which stresses the novel's role in constructing the 19th century American public sphere, and the voluminous collection A Companion to American Fiction, 1865-1914, edited by Robert Paul Lamb and G.R. Thompson (Wiley-Blackwell, 2005). Antje Kley is Professor of American Literary Studies at Friedrich-Alexander University Erlangen-Nuremberg (Germany). Antje Kley contends that my book focuses too exclusively on context and "casually ignores other factors at work in the construction of meaning, such as literary form, linguistic structure, and readers' expectations." She wishes I had written a broader book about meaning or "what specific elements make a work of literature literary," and, as if I had forgotten or never discovered that context alone does not define or describe a text, she criticizes my book because it is not the book of her imagination. In my introduction, I clearly stated my understanding of the complexity of texts and of the limited explanatory power of context when I said, "The chapters in this book are not intended to be complete discussions of literary works but as relatively brief examples of how to read texts in their contexts." Even if I had wanted to write the sort of book Kley imagines, I could not have done so. Each book in the Context series is limited to 50,000 words, so all I had the space to do was isolate the variable of context and explain its effect on the meaning of literary works. This book discusses the main, ongoing, disputed issues that are sometimes directly and sometimes indirectly embedded in the classic literature of the 1865 to 1929 era. The goal of each chapter is to broadly describe the issue, then to suggest how the issue was involved in representative literary works. Several major themes run through the literature, just as they run through the history: (1) those involving the acceptance or exclusion of certain racial and ethnic minorities; (2) those focused on the use of violence and mob action to achieve goals or as forms of self- or group-expression; (3) those focused on class conflict and the existence of great numbers of poor people and small numbers of rich people; (4) those involving efforts to fundamentally change things and to create a new, more equitable, more decent world; and (5) those involving assessments of whether the good and authentic American life was best lived in cities or in small towns and on farms. I did not "circumvent" anything. I wrote about literature that engaged the themes and issues under discussion, and I omitted the work of some major authors (such as Pound, Eliot, and Stein beyond Three Lives) because, as I wrote, they "left the US near the beginnings of their careers, resettled in Europe, and rarely wrote about life in America." The larger point, of course, is that contextualizing "literary writing in general" was not my purpose. I did not compose an encyclopedia. I wrote a brief book for a stipulated audience comprised of undergraduate and graduate students in literature, history and American Studies, common readers, and teachers/professors who do not already possess the historical or literary knowledge. My goal, like the goal of the series, was to provide those readers with clear, accurate, adequate, focused discussions of particular contexts and brief illustrations of how the contexts applied to representative texts. Kley says nothing about the issues I actually wrote about. Astonishingly, she also misleads her readers about the topics of my seven chapters. While Kley says my first chapter treats the Civil War, it actually considers how the Civil War was remembered and constructed by the political culture after 1880 and undercut by writers such as Whitman, Bierce, and Crane. While she says the second chapter treats Reconstruction, it actually explains the post-Reconstruction, when black Americans were put into virtual "serfdom." While she says the third chapter treats immigration, it actually explores inter-ethnic violence, violent responses to immigrants, the construction of ethnic stereotypes, and the beginnings of anti-immigration political movements. While she says the fourth chapter surveys "city-country differences," it actually presents the U.S. from 1865 to 1929 as a predominantly rural nation ("urban" was defined by the U.S. Census Bureau as incorporated places with more than 2500 residents) and highlights texts that try to assess the cultures of the countryside. Kley correctly says that my fifth chapter examines "economic inequality." But while she writes that my sixth treats Progressivism, by which I think she means moderate, government-sponsored reforms, it actually does something else: after briefly considering the Temperance movement, it turns--far more extensively--to 19th and early 20th century socialist movements, to labor-management strife, and to the union movement, including the revolutionary IWW. Finally, while she says that the last chapter recapitulates "the beginning of the First World War," it has nothing to do with that topic. Titled "Culminations" and divided into three parts, it first examines the suppression of radicals, including some writers and editors, after the 1917 U.S. entry into the war in 1917; second, it briefly treats the passage of Prohibition and of restrictions on immigration, the rise of the so-called second KKK as a political force in a number of southern and northern states, and the evolution of anti-Semitism and "100% Americanism"; third, it examines what the Hoover Administration argued was the persistence of massive poverty in some economic sectors and in some regions, despite some prosperity in some other sectors and regions. Though Kley later recognizes some of my other topics more clearly, she misrepresents many of them. At various points in her review, Kley admits that I do recover "historical facts," though she does not tell her readers what they might be. Recognizing that my primary research is "extensive," she concedes that my narrative is "informative," though she also finds it "rather conventional" (how my "extensive" primary research and recovery of facts could yield nothing more than a "conventional" account is not explained). At the end, she even grudgingly admits that my book could be useful despite the fact that it is "narrow" (by "narrow" I gather she means too focused on its subject, context and its effect on writing). But aside from these grudgingly conceded virtues, I am cast in this review as an "old" historicist (the horror, the horror!) who needs to be lectured about elementary literary theory and elementary definitions, a critic whose aesthetic is vulgarly "mimetic," and an authoritarian antiquarian who allegedly believes, as allegedly does the whole Wiley-Blackwell series, that "the stability of meaning may be guaranteed by the authors' engagement with the socio-political issues of the time and by the directness with which they express their presumed intentions." This "gotcha!" caricature of my position apparently stems from my comment, made when I was trying to explain the importance of my subject to my mostly non-professional audience, that meaning is lost when a text is taken out of context. For the record, I do not believe that accurate descriptions of context and text fix overall meaning for all time or guarantee anything. Probably like most literary scholars, I share Kley's sense that literature is subject to "the continually conditioned social practice of interpretive reception" even while I simultaneously believe, probably like most literary scholars, that setting literary works in their accurate contexts is vitally important. I am tempted to comment on every one of Kley's many incidental remarks about my book, but her misunderstandings, misleading descriptions, and silences on large matters make it pointless to correct her on small ones. So I will end with two general comments. First, my book draws upon and is informed by sub-fields of history such as labor history, economic history, political history, and social history. Over the past few decades, those sub-fields have profoundly energized and deepened our understanding of US history, and I believe that using their methods and approaches in my book -- as I have been doing for many years in literature and American Studies courses and in some scholarship -- substantially improves our understandings of the milieu in which American literature was created. I was, in short, not writing as a "historicist," old or new; I was responding to contemporary currents in American historical scholarship. Secondly, the validity and usefulness of the contexts I have discussed can be judged, in the end, only by examining my readings of representative texts. With a couple of exceptions, Kley does not examine them. But because I situate texts in their appropriate contexts, and because context does indeed contribute to meaning, I think other readers may discover in my book a number of readings that are fresh, interesting, provocative and most certainly not "rather conventional." Philip R. Yannella is Professor of English and American Studies at Temple University. Leave a comment on Antje Kley's review.